How can I reuse or recycle odd or bent knitting needles? | How can I recycle this? 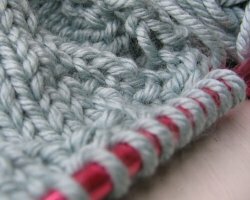 How can I reuse or recycle odd or bent knitting needles? A few weeks ago, someone emailed me to ask for creative ways to re-use old shopping bags. I directed her to the shopping bags post we did last year and told her about my experience of knitting some flimsy bags into a heavy-duty shopping bag: I used large gauge needles and it was surprisingly easy and fun – until I accidentally leaned on one of the (plastic) needles and snapped it clean in half. I could keep it in my stash to use as a spare in the future but I hope I won’t repeat my snap-happy snapping again so won’t need a spare. My needle stash is already quite sizeable (thanks to eBay and raiding my mum’s old needle collection) for the amount of knitting that I do and keeping spares might make it quickly spin out of control. But what else can I do with the odd ones? Or what about the couple of bent ones I’ve got a little over-eager about a scarf? Some of them are grey plastic while the bent ones are usually grey-painted metal. I use them as plant supports, pointed end down, especially in a circle around bulbs, e.g. daffodils or hyacinths which sometimes flop. I also tie the plant within the needles with string. Knitting needles are useful to keep for poking things out of inaccessible places. I use them for marking the ends of rows of seeds so i don’t forget where i planted them and pull them all up thinking they’re weeds. I know that the plastic ones are solid, but the metal kind are hollow on the inside. If you cut them up, you can use them for making jewelry or all sorts of things! Why not use the orphaned ones as purse handles? Jewelry making people will use metal knitting needles to make their jumps rings & such. Just wrap a coil of wire around it, & cut them up. Sizes already labeled on the needles. I use bent or orphaned needles to unclog the hose in my vacuum cleaner. I use my wooden ones to test when a cake is done. Single metal knitting needle can be shaped into a letter and hanged for decoration. Wooden needles can be used as hair pins to hold a hair bun together, Japanese style. Build a kite with them. Plastic knitting needles can be recycled into bangles or bracelets or other jewelry. Band them even more to make a bracelet. If you lack any knitting needles, use sticks from Pick a Stick game. Plant English ivy and use the knitting needle to form mini topiary. Use the knitting needle when sewing on sewing machine, for adjusting fabric close and under the sewing needle to prevent finger injuries. Cut needles into pieces and tie them with ribbon, thread, etc. to make cute crosses. I have quite a few knitting needles with no pairs to them. I have heard that you can craft them into many types of jewelry. I am also thinking that you can also recycle some types of them.